All the main application functions work well with any MP3 file, though subtitle files will make your life easier. 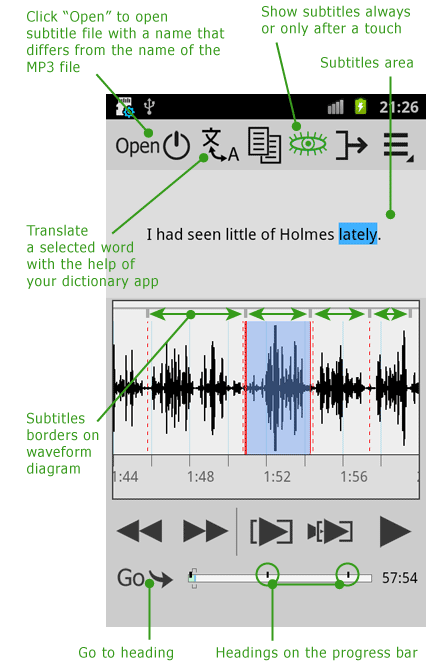 The major advantage is that you would not need to switch to another application to see the text, if a fragment of your audio is not clear. First, a subtitles area appears. Depending on whether "Show always" button is switched on or off the application behaves differently. To see subtitles for the selected fragment press in the subtitles area. Subtitles will disappear when you move onto the next fragment. Also you can hide them by quickly pressing again in the subtitles area. I suggest you study in this mode as it trains your hearing better. See more on Learning Methodology page. You can translate an unknown word in subtitles. First, select it by pressing on it for a few seconds. Then, press "Find in the Dictionary" button. Your dictionary app should be chosen at Settings Screen. 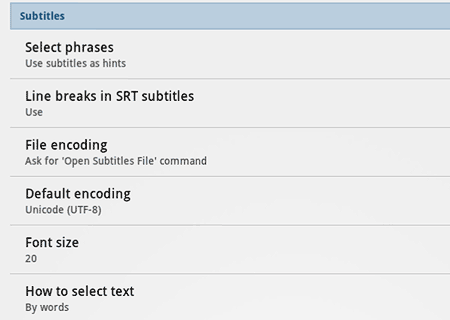 Subtitle file can have a table of content. In this case "Go" button shows "Heading" item. Also notches appear on the progress bar, showing headings’ positions. Secondary subtitles. Apart from the main subtitles, you can open additional ones. For example, if you learn Russian and you have a sound track of some Russian movie and subtitles in Russian and English, you can open English subtitles as primary, and Russian as secondary. In this case, if you doubt your translation of a Russian phrase, you can look into the version translated by the professional. To open secondary subtitles, press "Open" > "Secondary Subtitles File"
How to select text. Select "By letters" if you learn Japanese or Chinese, where words aren't separated by spaces. Suffix. 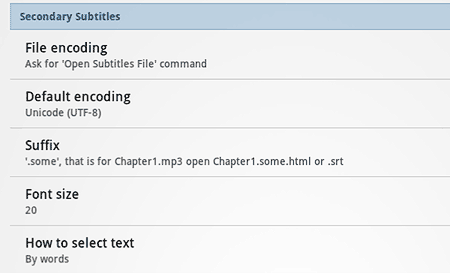 If you specify the correct suffix, the secondary subtitle files will be opened automatically. For example, if for file "01.mp3" you have secondary subtitle file "01.rus.srt", then specify ".rus" as suffix.